I started writing the post on Facebook and decided it probably warranted a full blog post, it has been a little while since I have done a personal post. Something has been weighing on my heart. Really this has been calling on my heart since I returned from Banff. I went for the Engage! Conference. I could and probably should do a whole recap on as I have been twice and it has changed my view of so many things. It has helped elevate my client experience and my business. More on that at a later date. My friend Jove Meyer spoke at Engage when I was there about inclusivity and connecting with LGBT couples. Anyone who knows me, knows I have and will always be a fierce LGBTQ+ ally. My journey to understanding how important this was to me began when I was in a production of The Laramie Project in College with the fabulous Christy Montour-Larson . Yes, I used to be an actress, which is another story, for yet another day. We met with Matthew Shepard’s Mom Judy. We watched videos and saw evidence including graphic photos of Matthew’s face where he was beat. We went to the fireside lounge where he was last seen alive, walked the halls of his classroom where he spent every day in college. We went out to the fence, where he was left after they had beat him to a pulp and left for dead. I tear up thinking about it. To walk his struggle and see where this real living, breathing person was beat to his eventual death was soul shattering to me. I could picture him tied to the fence in so much pain, freezing, looking up at the clear Wyoming stars in the sky and asking why he was so hated because he was gay? God created all equal. Why is there so much hate in our world? I will never understand, but I will always advocate for less of it. Jove took me back to that place of realness, walked us down what the struggles look like for this community on a day to day basis. These are real people who face adversities everyday. Things as simple as not being able to donate blood. Simple human things that people of privilege like myself take for granted. I had a conversation with a person the other day about the political climate for LGBTQ+ people whose argument was that we’ve made so much progress with this subject and we are way ahead of other places in the world. That for the people who are hateful towards LGBTQ+ people – there is probably no changing their minds. I really dislike this attitude towards any subject but this one especially made my heart hurt. Yes, we are lightyears ahead of countries that you can be punished by death or imprisonment or conversion torture, but it does not mean we do not have a ways to go. Like with issues of women’s rights, racism, or our LGBTQ+ friends; as long as someone is being marginalized, we all have a responsibility to do better. Start here and it will spread to other areas of the world. We are supposed to be leaders of a free world. We can still do and be better. Maybe she is right about some people. I am sure that there are people out there that refuse to accept love is love and that all people are made in God’s image, but I don’t believe that means that we are to stop progress on the subject or stop trying to change their hearts. Even as I sat yesterday and listened to Jove for the second time and watched as he poured his heart on stage giving example after example of how much farther we have to go for equality, I still learned something. I can still learn more. I can still be a better ally. I can always strive to be better. To be more compassionate, loving, caring, a better servant of the God I believe in. The one I believe that will love you where you are no matter who you are, especially when he created you how you are. So, I am constantly trying to do this actively. How can I educate people with compassion over and over, even when they don’t get it? I owe it to my friends, colleagues, the LGBTQ+ community and any marginalized group to always learn more and be better and speak up. I implore my fellow friends, clients, colleagues to please let me know if I am ever saying something that marginalizes anyone. We can all hold each other accountable. I appreciate the conversations and having people I trust to come to with questions so I can be the best ally possible. So my challenge to you is to do this too. We can always be better. We will never be perfect, but it does not mean we should not strive for perfection and progress. Maybe I change one heart, but maybe I change hundreds or even thousands. For me it is worth the effort to make sure all are really created equal. I will be making a few changes to my website in the next few weeks to be more inclusive on my website. I want to include more of all people. I have had inclusive language on my website for years but switching up images to make sure all couples feel equal walking in the door. I am doing a styled shoot next week I am so excited to share celebrating this. I also will be sending out a form that all my recommended wedding pros will sign indicating they are inclusive, they will otherwise be removed from our list. I have been very careful in the past but I want it in writing so that my couples know that I have their backs. I have a no discrimination policy with any of my employees, contractors, etc. If you are not inclusive you do not work for me. Period. You are the company you keep and I will always be and always have been one that includes all love. I want that of my couples, my fellow colleagues, venues, friends, family too. I will leave you with a few images. The first of me balling my eyes out at Jove’s first presentation. No shame. This subject will make me cry every single time. (Photo by my dear friend Carla Ten Eyck) The rest are mine. The second image from Jove’s presentation yesterday (he might kill me for posting a crying photo), and then the ones after celebrating a few of my awesome lovely LGBTQ+ couples we’ve had in the last year. We would love to serve more of you out there and honor you and your day. If you want to have a conversation, my door, messenger, phone is always available (you know between weddings, travel, two kids, a husband, and helping change the world). I have also included a link to the #OPENCO information I was given by a gubernatorial candidate on a google drive if other businesses in Colorado would like to share their support (links and info is below the images). Love is love and I truly believe that marriage is about love not gender. 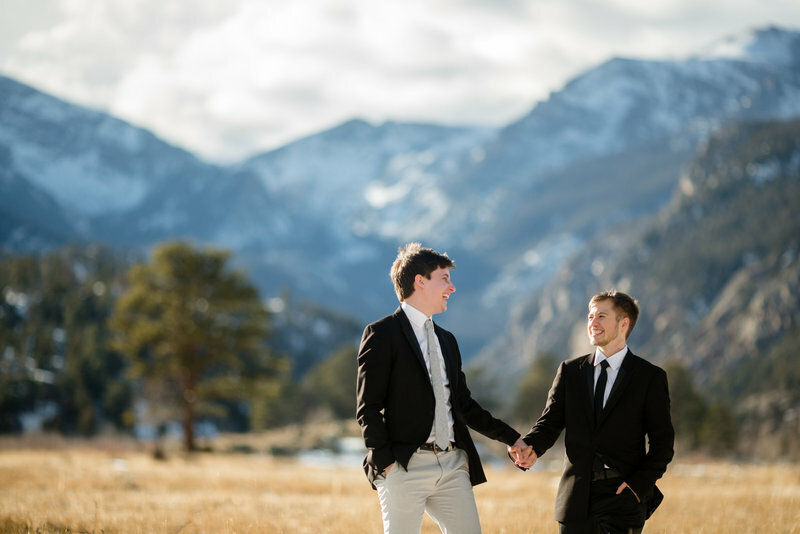 The Supreme Court sided with a Colorado baker who refused to create a gay couple’s wedding cake on religious grounds. No matter how narrow the ruling, this decision communicates to LGBTQ Coloradans that, in some spaces, they are not welcome. It’s time for all Coloradans — especially those of us in the wedding industry — to take action. I’ve joined the #OpenCO movement and am asking you to do the same. Every couple deserves all the joy in the world when planning their big day. No one should be humiliated by asking for services that will be refused because of who they love. Now is the moment all Coloradans must stand with the LGBTQ community. ● Post the #OpenCO logo on your business website and in your store window. ● Affirm that you are an #OpenCO business on social media using these sample posts. ● Recruit others to join the movement using an email or post like this. In the words of Charlie Craig and David Mullins, the couple at the center of the case, “We will continue fighting until no one does.” Join the fight with me. Award winning wedding photographers available worldwide based in Denver and Breckenridge Colorado. I am known as the romantic outdoor wedding photographer for carefree couples. All Sarah's packages include airfare or travel to your destination nationwide and to some destinations worldwide. My partner Erin's packages are also available to photograph your wedding day but prices do not include travel to all locations. Areas I frequent often include: Breckenridge, Keystone, Boulder, Copper Mountain, Silverthorne, Vail, Beaver Creek, Aspen, Snowmass, Ouray, Telluride, Gunnison, Colorado Springs, Estes Park, Lyons, Tabernash, Granby, Grand Lake, Steamboat Springs, Park City, Grand Tetons, Larkspur or anywhere our romantic couples take us. Places I would love to go: Anywhere in the Canadian mountains, New Zealand, The Alps, France, Italy, Scotland, or pretty much anywhere outdoors with an amazing views and laid back awesome people. I have always and will always be inclusive of all race, creeds, religions, orientations. I believe we are all worthy of love and belonging.